The cornea is the clear window into the eye which aids in focusing light for clear vision. 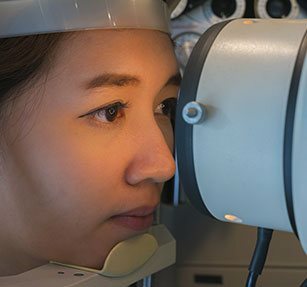 Physicians at BMC diagnosis and treat corneal disorders including infections and ulcers, keratoconus, Fuchs Dystrophy, and other problems affecting the cornea. Refractive surgery can reduce or eliminate a person’s dependency on contacts and glasses by correcting nearsightedness, farsightedness, and/or astigmatism. When patients come in for a consultation, the doctor will conduct a thorough evaluation to determine if LASIK, LASEK, or lens surgery is the right approach. To perform the surgery, the doctor will use an all-laser system that reshapes the eye to an optimized, naturally aspheric (not perfectly round) corneal shape. Using this technique, precise, personal treatment to a broad range of patients is achieved. Upper and lower lid blepharoplasty procedures remove wrinkled skin and bulging fat from the eyelids. These procedures help restore a more youthful appearance and reduce the feeling of heaviness caused by the excess tissue. Excess skin in the upper eyelids can cause a person’s brow to appear droopy. Through several small incisions behind the hairline, endoscopic equipment can lift the forehead and brows to restore a smoother, less wrinkled forehead and higher eyebrow position. Prominent facial lines can be misinterpreted as anger, anxiety, fatigue, or sadness, and contribute to the look of an aging face. A number of factors cause these undesirable lines, including fat atrophy, sun damage, chronic gravitational changes and hyperfunctional lines. Hyperfunctional lines are the result of muscles contracting beneath the skin, and are sometimes referred to, depending on location, as crow’s feet, lipstick lines, forehead furrows and glabellar folds (between the eyebrows.) When attempting to eliminate these wrinkles, it is important to address the underlying physiology, which means paralyzing the muscle. These injectable fillers are a safe and effective option for the treatment of unwanted facial lines and creases, providing a more youthful appearance. Injections are performed in the office and the effects, depending on the product selected, last for months to over a year.